Whether your goal is to become independent of the grid, grid tie, supply emergency power or simply reduce your electric bill; West Virginia Solar is available to ensure you get a system that will power your needs! The Wind Power in West Virginia is some of the strongest in the nation. Wind Energy or wind in West Virginia can power your home if you have a good wind site! Utilizing a small wind generator can be not only easy but fun and profitable. Wind Turbines can produce some or all of your power needs to reduce your electric bill or even power several homes. You can pump water, charge batteries, turn your meter backwards, net meter, get credit on your electric bill, provide remote home power. 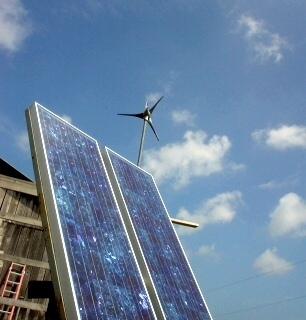 Wind generators can be used in hybrid systems using solar power and wind power together. We have simplified systems that grid tie to send green energy back to the grid. Green power reduces carbon footprint on the planet. West Virginia Solar now has 30 foot and 50 foot tilt up monopole towers. contacting your dealer. This gives you even more independence! Where there is Wind, Sun or Water; there is Free Electricity! NEW: Skystream 3.7 from Southwest Wind Power. The Skystream 3.7 is a Grid Tie 1.8 KW wind generator that is ready for grid tie. The Skystream 3.7 is a new generation residential wind generator that hooks up to your home to reduce or eliminate your monthly electrical bill. Its the first all-inclusive wind generator (with controls and inverter built in) designed to provide quiet, clean electricity in very low winds. This makes Skystream ideal for residential homes and small businesses. Your local utility has an existing interconnection agreement (Your Skystream dealer can help determine this). 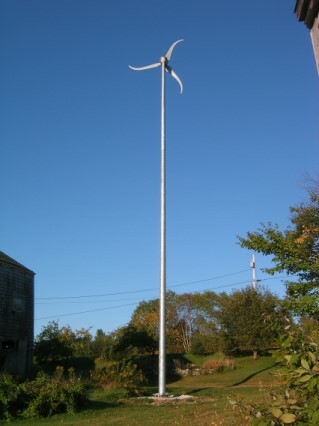 West Virginia Solar is now distributing Southwest Wind Power Wind Generators! The Southwest Wind Power Air Series has been the hall mark of Sailors, Power Boaters, Remote Homes and Cabins for years. Reliable, simple design, and auto-furling to protect itself from abnormally high winds. Year round power for your needs. 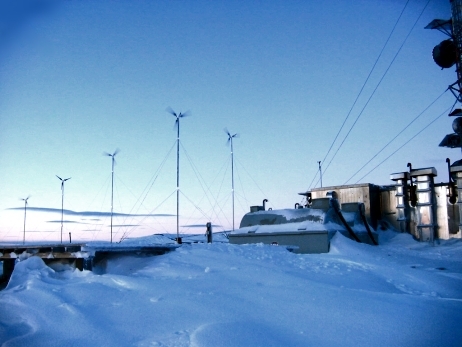 Remote Homes, Telemetry, Oil Rig Platforms, Farms, Water pumping systems, Remote Residences, and Village Power Supplies - With the advances in Wind Generator systems from Southwest Wind Power over recent years, areas that would previously have been considered uninhabitable or without electricity now have the ability to produce power any time the wind blows above 7 miles per hour. The Southwest Wind Power Air-X series is utilized globally to provide power in several different voltages for a variety of needs. The Air-X is self regulating so a charge controller is no longer a necessity, and, you can do without a diversion load and controller if you choose. I have seen homes in Hawaii, Alaska, Greenland, Germany, and more powering thier way into the future with windmills manufactured by Southwest Wind Power! Pricing Below without shipping or towers. Call (304)677-9974 for details. More than 50,000 Southwest Windpower wind turbines are used on remote homes and cabins around the world. Whether your remote home is for a weekend get-away or you live there full time, Southwest Windpower has a wind turbine to match your energy needs. Best of all, our products are designed to make it simple for the user to site and install. If you have a wind resource greater than 8mph (4 m/s) and your area is free from obstacles then a wind generator will likely be a good match. It is that easy! An important reason to have a wind turbine is because of the seasonal variations of your solar and wind resources. A hybrid system that uses both solar photovoltaic panels and a wind turbine will make the perfect compliment that provides minimal interruptions in power. Depending on your energy consumption and wind speed, the chart below will help you decide which turbine best fits your needs. RECOMMENDED PRODUCTS FOR REMOTE HOMES AND CABINS  This chart depicts the estimated kWh production of each wind turbine. Depending on your location, performance may vary. West Virginia Solar provides its clients with an experienced staff to assist you with system design and help you locate an installing representative in your area. Where there is sun, wind or water; there is free electricity! Your source for Alternative Energy Products covering solar, wind and microhydro-electric systems. Whether your goal is to become independent of electric bills, supply back-up power for lighting, computer systems or heat, West Virginia Solar provides state of the art technology with the best customer service we can offer! West Virginia Solar sells Alternative Energy Systems, Solar Panels, Kyocera, BP Solar, Unisolar, Robison Solar Water Pumps, Grundfos Solar Water Pumps, Lorentz Solar Water pumps, Luxeon Leds, Superbright Leds, Sign Lighting, Microhydro-electric systems, Traffic Warning, Solar Warning Flashing Systems, Security Lighting, Southwest Windpower Windmills, Wind Generators,Trackers, Windmills, Inverters, Charge Controllers, Xantrex, Outback Power, Lightning Protection, Batteries, Deka Dealer, Surrette, Trojan Dealer, Stand-Alone Systems, Grid-Tied Systems, Battery Back-up, Systems, Sunny Boy, Photovoltaic Dealer! get a system that will power your needs! Solar Water Pumping - Anywhere there is sun or wind, systems that supply water reliably! need solar in West Virginia, Solar in Maryland, wind power in West Virginia or alternative energy products, WV Solar is the place to come to for the best products and professional design of your new alternative energy system. Send email to info@westvirginiasolar.com with questions or comments about this web site.